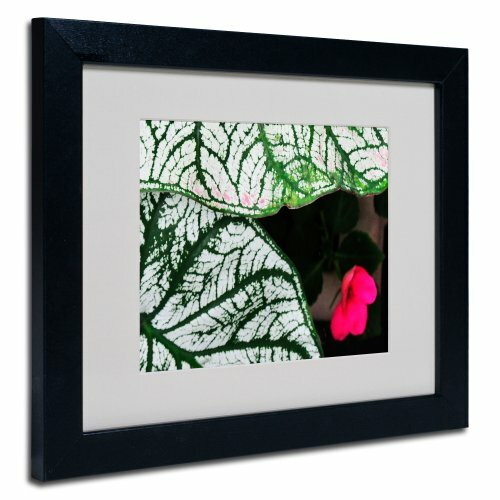 This ready to hang, matted framed art piece features a pink flower behind large white leaves. Kurt Shaffer has been a self-taught photographer since age 13 (1970). He continues to learn the fine art of photography, especially in this fantastic digital age. Though Kurt does not manipulate his fine art photography, digital enhancement is a valuable tool in his business. He states that if he were to change anything in his work it would be to make it look more like it was when he took the original photo. Kurt's love of the earth feeds his photographic creativity and defines it as his truest form of therapy. When photographing people, capturing the nature in his subjects is Kurt's intent and what he strives to do. An 8x10 giclee print under acrylic in an 11x14 black frame. Giclee (jee-clay) is an advanced printmaking process for creating museum quality fine art reproductions. This high quality print is matted using antique white matting and comes in a black frame. A clear acrylic facing is added to protect the print. The piece is fully assembled by professional framers and comes ready to hang. The antique white mat allows the image to really stand out, making it a great addition to any space.